The digital radiographic testing procedure requires image plates instead of a radiographic film, whereas the so called direct radiography (flat panel detector) works without an intermediate medium. The X-ray image is generated without interim steps. Over time, image plate systems are used more frequently in non-destructive material inspection procedures. They are considered as a so called film substitute system. Instead of film material the technique requires phosphor image plates which are used similarly to X-ray films. The installation and exposure is handled in almost the same way as in film technology. With the help of an image plate reader the potential image is read out and destroyed subsequently. The image plate reader exposes the plate with bright light so that it can be reused right after that. The reusability of an image plate depends on many factors. Experience has shown that – depending on application and handling – between 500 and several thousands of scans are possible. The digital image evaluation is executed on the monitor by means of a special program. This ensures a fast image quality evaluation and a swift assessment of potential indications. The detector technology, also called direct radiography, makes use of a flat panel detector which directly records dose rate differences and transmits the information to a computer. There are two different systems that can be employed stationary (bunker or cabin) and portably. Also, the installation is handled in a very similar way as in film technology, but with minor differences: the detector cannot be adjusted to curved surfaces. Compared to film or image plate technology, the exposure time is significantly lower. There is no intermediate step of development and readout. 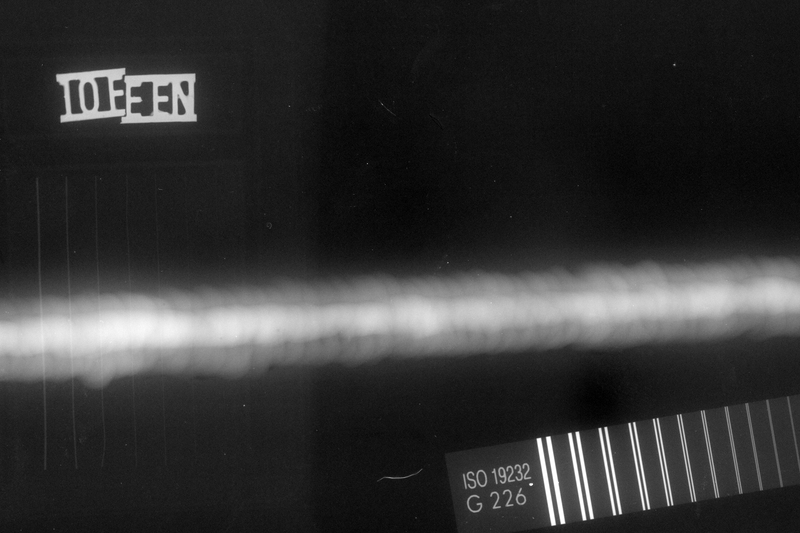 Only a few seconds after completing the exposure process, the X-ray shot is displayed on the monitor. Once again, the digital image evaluation is executed on the monitor by means of a special program. Production testings or components with very complex geometries (e. g. automotive industry components) require inspections via computer tomography. With the help of a manipulator, the component is moved between a radiation source and a detector while shots are taken at each point. These are merged to create a 3D model of the component.